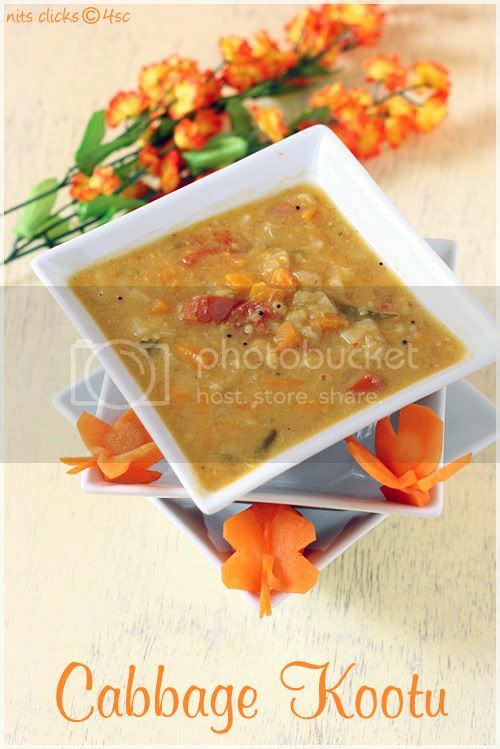 This cabbage kootu or sambhar is one of my most favorite recipes from my mom's collection and I remember enjoying it since childhood. Not sure if it is a common recipe to all, yet it definitely demands a place in my blog for its amazing taste and flavor. Pressure cook the thoor dhall until soft and mushy. 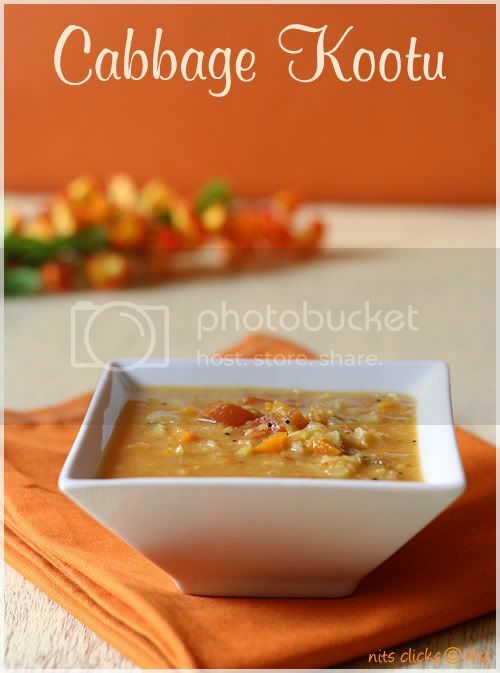 Chop cabbage, carrot and onion. Dice tomatoes into cubes. Grind the coconut, red chillies and cumin seeds into a fine paste by adding a little water to it. Take a pressure pan and drop in the cooked dhall, shredded cabbage, onion, tomato, ground coconut paste, tamarind paste, hing and salt. Pressure cook until two whistles. 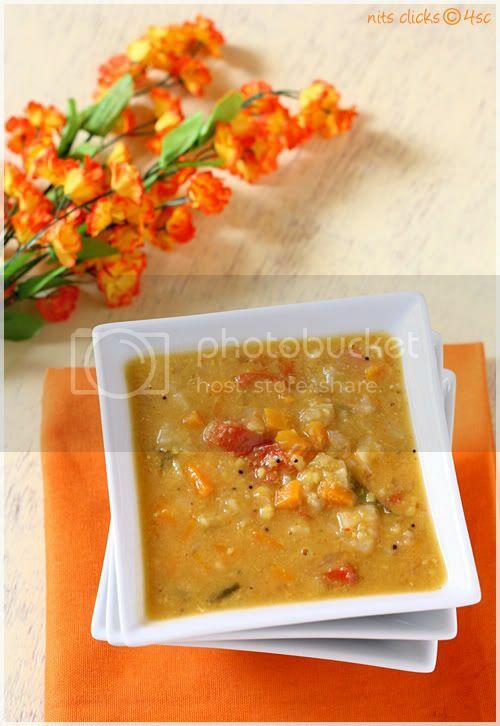 Transfer to the serving bowl and temper with mustard seeds and curry leaves. Hot and yummy cabbage kootu is ready. 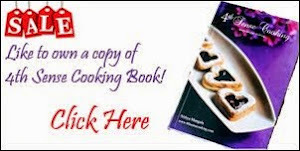 Serve it with rice and chips. It also goes well with Idly and Dosa. You can replace cabbage with snake gourd, raw tomatoes(green ones) and chow chow too. Lovely presentation n carrot butterflies looks amazing! Looks yummy and lovely presentation!!!! Wow! look gorgeous luv ur carrot design. Superb presentation as always Niti so cute and comfort dish. Oh, this looks so good I can almost taste it! The picture looks like you maybe added carrots(?) and curry leaves to your recipe. Is that right? Thank you Marialyn for pointing out the error. I forgot to mention them in the recipe. Did the correction right now. Wow! Looks fabulous. Wanna grab a bowl please! Such a nice comforting kootu..I luv the fact that its made in sambar style and am sure my lil one will luv it, shall give it a try.....Good that u shared it! we used to cook this in group... reminds my bachelor days.... nice presentation. simple and comforting kootu with awesome presentation. The dish sounds so hearty n delicious ~ absolutely mouthwatering pics n loved those cute carrot butterflies! OMG!!!!! mind blowing snaps Nits. Loved the carrot flowers a lot. Yummy and it looks so different. Never tried cabbage smabhar before. lovely kootu and awesome presentation...very creative idea! I have very few recipes in mind when it comes to cabbage. This looks like something I should try next time. Nice presentation. Cabbage Kootu looks like a comfort dish.Lovely presentation. yeah its not very common one, as normally cabbage is used in dry veggie most of the time. This looks inviting. 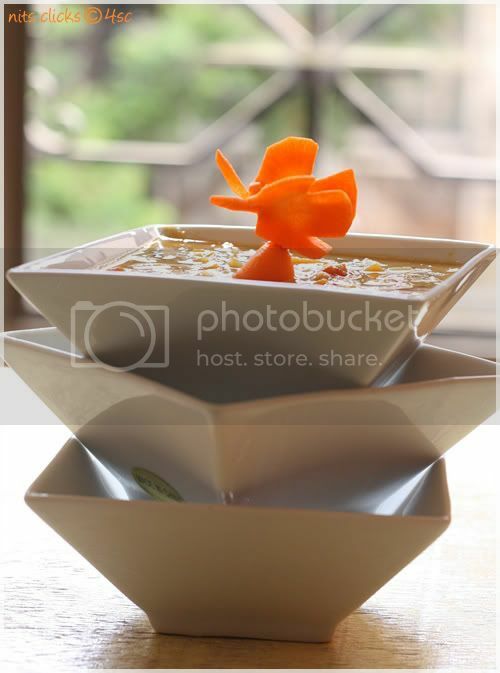 Love those carrot butterflies looks damn cute, delicious sambhar.. This I make very often, lovely clicks! 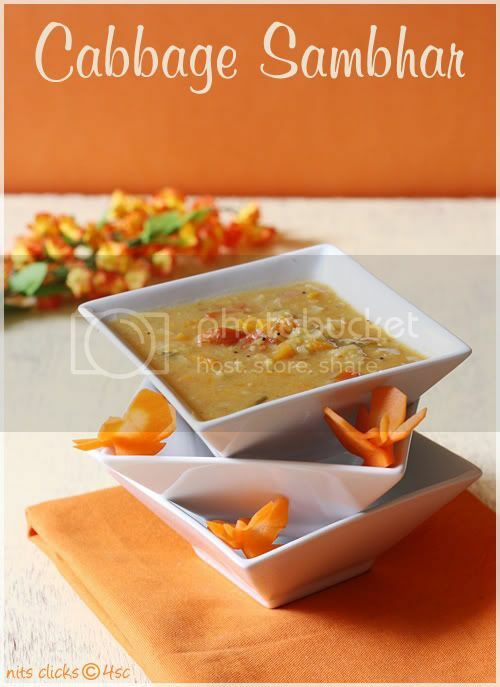 Lovely presentation, sambhar looks so delicious. Delicious cabbage kootu and nice presentation,looks amazing.